I’m a huge believer in being grateful, not taking things for granted, and the pay it forward initiative. I’m very aware of how lucky I am to have such a successful YouTube Channel and blog and after I sold my salon in January, I was thinking about ways I might be able to put my millions of monthly views to a good purpose in a way that would benefit others. I decided to start – what I hope to be – a monthly featured charity, but focussing on the charities that make such a difference, but might not get the mainstream publicity that other charities do. 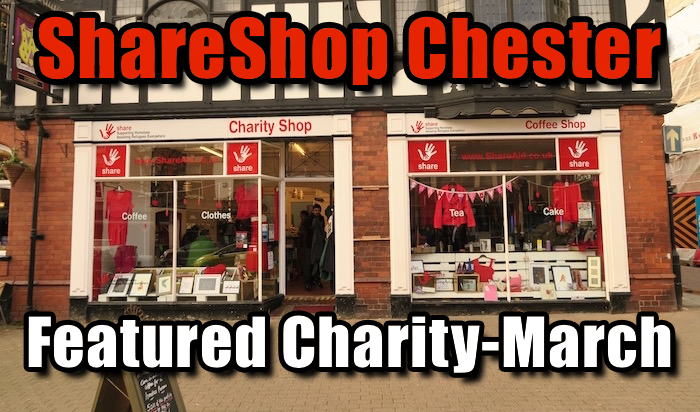 With that in mind I’d like to introduce you to March’s Featured Charity – Share Shop Chester. What Is Share Shop Chester? What makes Share Shop different, is that it is not only a lovely coffee shop within a charity shop, but also a place where members of the homeless community can come and take a seat in the warmth, and have a cup of suspended coffee. The minute you approach Share Shop, you can tell that so much love and thought has gone into it, and once you step through the doors, you feel like you are visiting one of your oldest friends at home. The concept is ingenious. You can pop in for a browse in the charity shop, grab a coffee on the go (they make THE best latte’s EVER! ), or take a seat and enjoy your drink and some lovely homemade cakes and snacks. Whilst you are there, you can chose to “Suspend A Coffee”, which means that you pay for a coffee that gets marked up on the board, and when a homeless person wants a warm drink, they can come in and enjoy the coffee that you have bought for them. The lovely touch is that you can write a thoughtful message on the coffee sleeve. Never underestimate the power of a few kind words or actions. 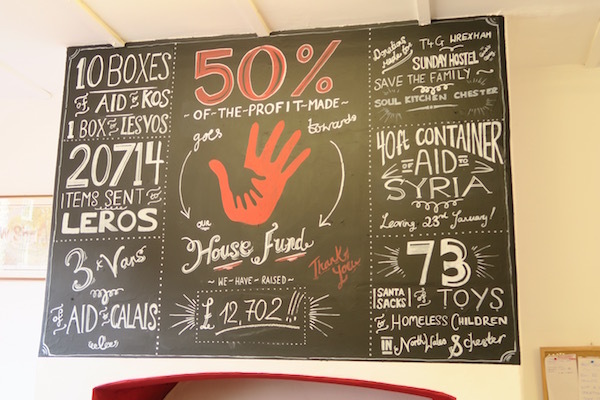 The profits from Share Shop are split 2 ways, 50% goes to chosen charities both local and abroad and providing aid for Syrian refugees. The other 50% goes into a “House Fund”. Now this is such a clever idea. 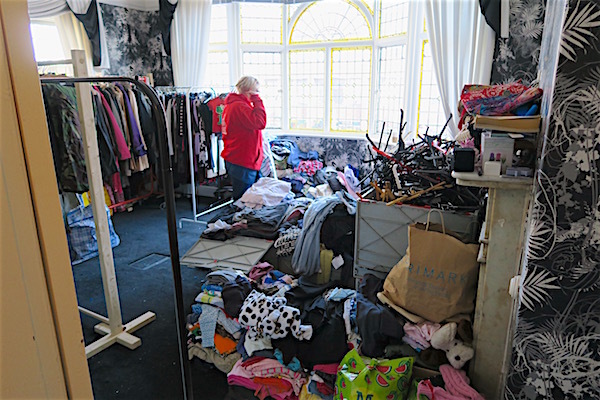 The charity Share, which is behind Share Shop Chester, have seen a derelict house in Chester for £97,000. They want to raise enough money to buy the house and then will renovate it. Once finished, 4 people who are currently homeless, will be given a room and a roof over their heads. They will be provided with jobs at Share Shop, and professional support to enable them to be moved when ready, into their own flats. At this point, another 4 homeless people will be given rooms. I was blown away by the thought and planning that has gone into this. Not only is the shop raising money to buy the house, but today is “Buy A Brick For £1” day! This means that you can donate a pound to buy a brick for the house, and not only have you given money to an amazing charity, but instead of disappearing into a pot, you will actually be helping to give a homeless person a home. All for just £1!!! If you want to donate you can visit the crowdfunding page here which is open until 2am on 27th March so don’t delay. Adam gave me a tour of the store and behind the scenes and it really was awe inspiring. Room after room of donations being tirelessly sorted by a flurry of cheery volunteers. In each room the donations are sorted and split, with some going into Share Shop itself, and the rest sorted into containers to send overseas to assist the Syrian refugees in crisis. It was amazing to see how generous the people of the North West are. 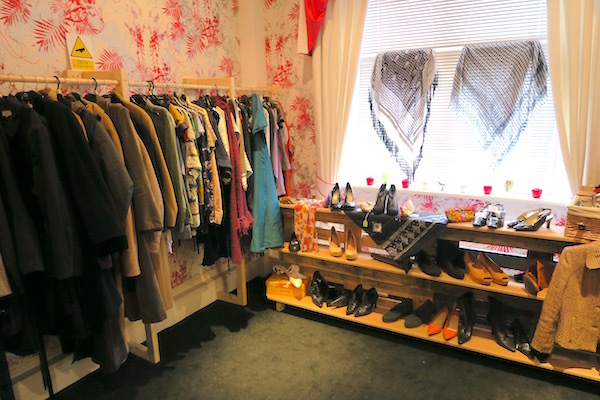 Downstairs the Charity shop is meticulously laid out, there’s even a gorgeous Vintage and High Street area. I desperately want to go back to have a proper look through the Vintage area as I adore vintage pieces. 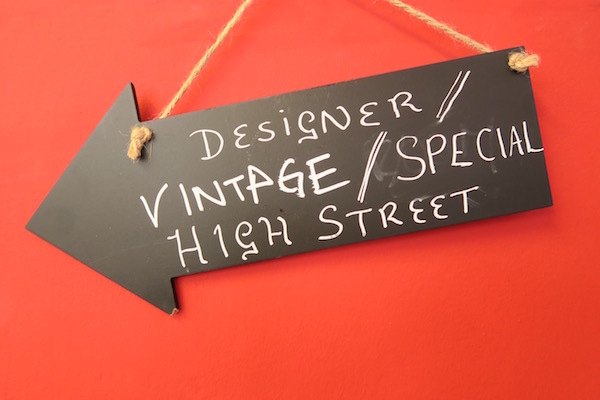 This place is like a beautiful Aladdin’s cave of amazing items just waiting to be discovered! Outside, in Share Shop’s porch, is one of my favourite bits of the shop; The Kindness Wall. This is such a brilliant idea. 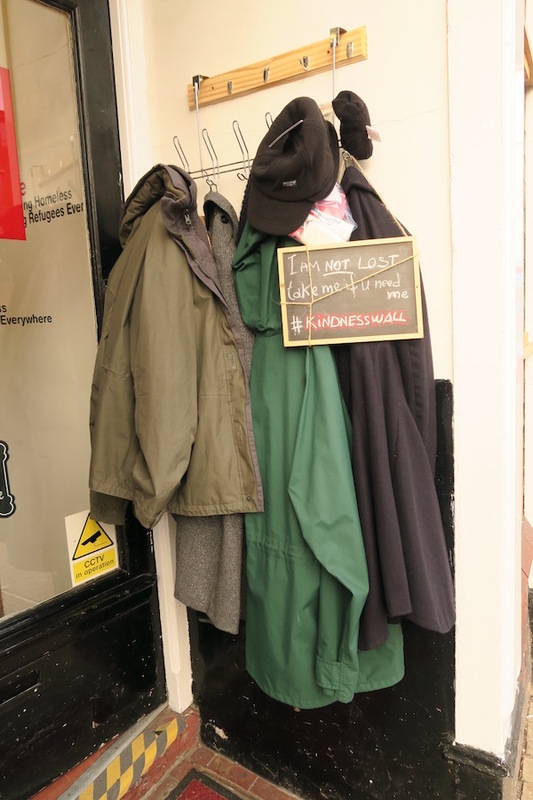 You can pop by at any time of the day or night and leave coats, hats, gloves, scarves, toiletries, bags, sweets etc hung up on the #kindnesswall with a little note in the pocket . Then a homeless person can pop by any time, and get themselves something warm to wear and a little sweet treat. If you have any travel/hotel toiletries left over from any visits, these can be perfect to leave in the pockets as well as ladies sanitary items. Such a simple idea, but I witnessed myself what a difference it made being able to get a nice “new” warm coat and a few little treats. Whilst I was visiting I witnessed first hand how amazing the Share Shop concept and family really is. 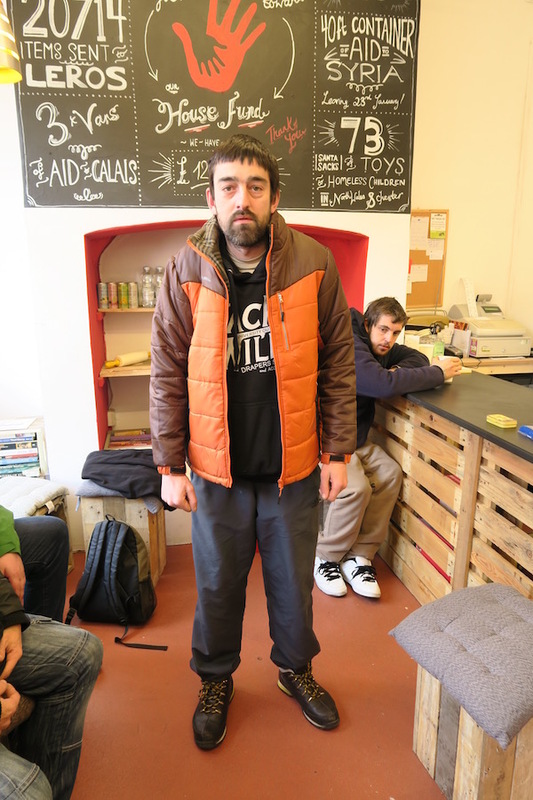 A homeless gentleman popped in and asked Adam if he possibly had any new trainers, as his existing ones had holes in and were falling apart. 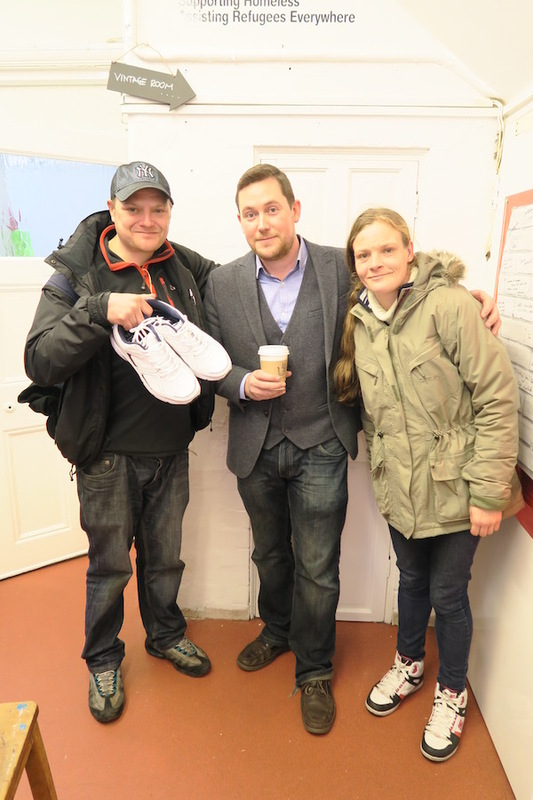 Adam asked his shoe size and popped straight in the back bringing out a lovely new pair of trainers. This is what sets Share Shop and it’s volunteers apart. The level of genuine devotion and determination to make a difference. Chatting with some of the members of Chester’s homeless community whilst I was there, it was so hard not to get emotional about how they felt Share Shop Chester had made an immediate difference and improvement in their lives. The biggest change for them, was the feelings of hope and acceptance; that they were not just a hindrance or invisible. As I left Share Shop Chester and drove home, I just couldn’t stop thinking about everything I’d seen and felt in just a brief couple of hours. I went home and told Ric (hubby) about everything I’d found out; the hope and dreams for the future of Share and Share Shop Chester, Adam’s vision for a #kindnesswall in every town and city, and a group of Share Shops dotted across the country, making a difference to not only local and international charities, but to the local homeless community. I’m looking forward to watching Share Shop Chester grow from strength to strength and would like to thank everyone there for making me feel so welcome, and for the best latte that I’ve ever tasted!